I think of March as the beginning of Spring. Not the day of the spring equinox, but just the calendar turning to the month. Growing up in Arkansas, the weather definitely changed in March. While we would get cold fronts moving through, overall the weather was warmer and the days were growing longer. Daffodils appeared, their bright yellow flowers reflecting the sunlight of the longer days, or providing a splash of color against the still-brown ground. 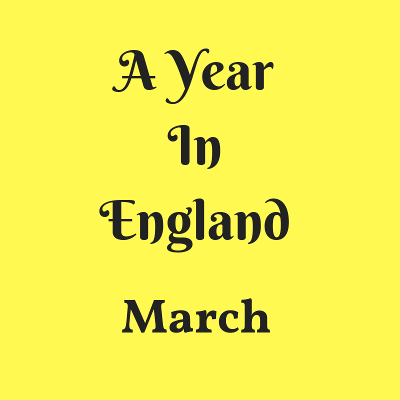 During my year in England, I still thought of March as the beginning of spring. Even though the temperature wasn’t what I expected for that month, the days were definitely longer and a few bright flowers were beginning to bloom. I felt like getting out and about more. It turns out I wasn’t the only one. York, with its grand Minster and narrow medieval streets, was less than 30 miles from Cranswick, the village I lived in. I made the trip over every couple of months but had not walked the wall that surrounded medieval York. I wanted to walk it since my first visit, but other things always seemed more important, the weather wasn’t agreeable, and it had not happened. Today was the day to change that. Overcast and chilly, I climbed the steps and began. I looked over rooftops to see the towers of the Minster rising above. I saw the town spread out below and wondered how that same view had looked centuries earlier. I happily walked the wall, taking in the sites of York and listening to the people and traffic passing by. Sections of the wall are gone, so you go back down to street level, walk to the next section, and climb back up. As I headed down the stairs toward the street, I passed two women and noticed something different. French. They were speaking French. After months of hearing various English and Scottish accents, it stood out. “The tourists are back,” I thought to myself. “I have to share with tourists again.” Of course, there were tourists visiting York all year, but this was the first foreign language I had heard in months. The weather was improving and people were getting out more like I was. What surprised me was my reaction. After seven months in England, I felt like a local, like I belonged. England had become my home. It was an interesting sensation. What had been strange was now common. The same feeling happened when I moved to Daytona Beach. I had been a tourist here several times, yet less than a week after moving here, I found myself muttering at vehicles with out-of-state license plates who were uncertain where they were going. “Damn tourists,” I said. I continued my walk around the wall then made yet another visit to the Minster. Returning to my car, I got in and navigated out of the city. Reaching the more familiar roads near my village, I realized I was more comfortable driving on the left side of the road. It was easier to get around than a few months before, yet another step in making England feel like home. Making a home in a foreign country is different for each person doing it. At first, I looked for what was similar to what I had known before. What was new and different stood out in stark contrast. I loved some of these differences – milk delivered to my doorstep each morning, food to try I had never heard of before – and didn’t notice them becoming familiar. Only when I would stop and look back, or when I would talk to someone back home, did I realize that what had been foreign was now familiar. And I was about to get the chance to explore this idea more. The next month, April, my parents were coming for a visit.